National Super Alliance (NASA) presidential candidate Raila Odinga is confident he will triumph in the first round of the presidential election. Raila said Kenyans had embraced NASA in all the regions he has visited and told Jubilee leaders to prepare to hand over power. “We are sure of more than 10 million votes in the August election ” said the Orange Democratic Movement (ODM) party leader. Speaking during a rally at Ndanai trading centre in Sotik Bomet county Raila said Jubilee Party was losing ground among Kenyans. “Kenyans have lost faith in Jubilee and we are giving them a free ticket to go home in the first round,” he said. Raila was in the company of Bomet governor Isaac Ruto and Suna East MP Junet Mohammed. The Opposition leader also tore into Jubilee, saying farmers in the South Rift had nothing to celebrate about Uhuru’s leadership. He said tea farmers have had to survive on poor prices for their produce due to the government’s failure to intervene. He said his government would prioritise the improvement of farmers’ earnings in the region. Raila asked residents to support his candidature, saying his government would also address, among other things, milk prices and maize farming challenges. He said it was sad that dairy farmers were being paid a paltry Sh30 per litre while processors were reaping more than Sh100 for the same quantity. He also pointed out what he described as unfulfilled promises by Jubilee. NASA candadate Raila Odinga speaks to officials who had just defected from Jubilee. Courtesy photo. Sharing Raila’s sentiments, Mr Ruto said the road projects Jubilee leaders were citing in their quest for re-election were sub-standard. The governor also said Kenyans should bank on NASA to deliver free secondary education. 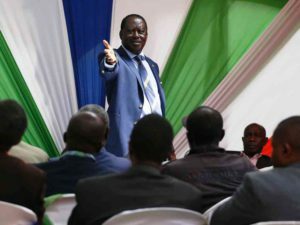 Speaking elsewhere, Raila defended his criticism of the ongoing construction of the Sh34 billion Itare Dam in Nakuru County. He said his opposition to the dam was not part of a political strategy to win the Kipsigis vote but was informed by the environmental concerns raised by the Kipsigis Council of Elders. Speaking in Kusumek village of Bureti constituency in Kericho County, where he attended the burial of former Nyanza Provincial Commissioner Isaiah Cheluget, Raila maintained that the dam would have a major environmental impact, especially in counties that depended on rivers originating from the Mau Forest. Also present at the funeral were Kericho Governor Paul Chepkwony. Jubilee leaders led by National Assembly Deputy Speaker Joyce Laboso, who is also the Bomet governor candidate, Elgeyo Marakwet Senator Kipchumba Murkomen and his Kericho counterpart Aaron Cheruiyot arrived at the funeral after the NASA leaders had addressed the mourners. 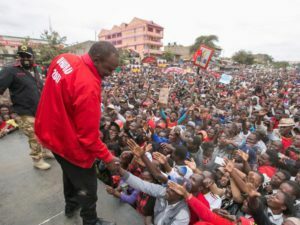 “The General Election is about numbers and I appeal to all members of the Kalenjin community to come out and vote for President Uhuru Kenyatta and Deputy President William Ruto,” said Dr Laboso.